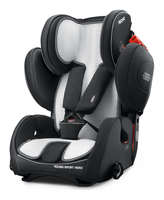 The new RECARO Young Sport provides your child with a novel 5-point harness system that provides for the age group I (approx. 9 months to 4 years) for "growing " safety. When sizing the backrest, the harnesses are automatically in the correct position, thus affording your child optimum. As soon as your child grows, you simply remove the harnesses. Your child is then secured with the vehicle's 3-point belt. NOTE: The new Recaro Young Sport models have no more belt alarm. This childrens car seat is without ISOFIX.